One time I was on a fire that destroyed eleven homes in Ashland, Oregon. 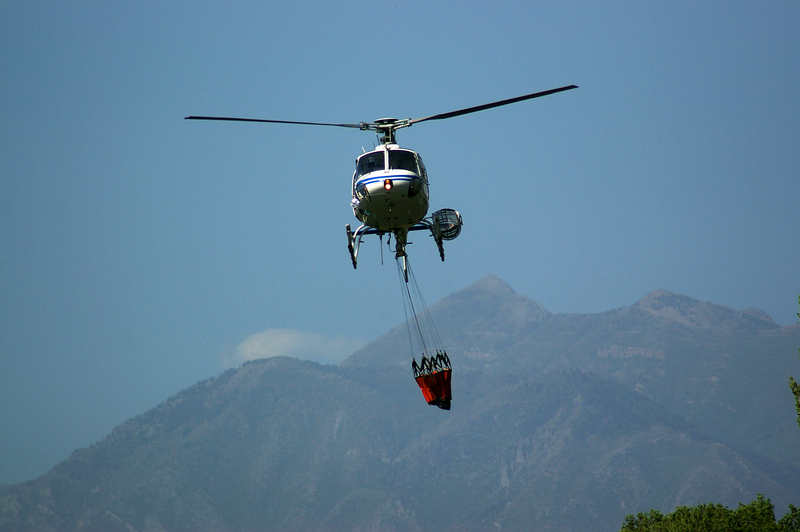 One of our tactics on that fire was to use helicopters to drop water on the burning houses. When the helicopters began operating it was important to keep them from dropping water on one particular house where firefighters were working inside. That’s because a helicopter water drop can push fire in all directions, in spectacular fashion, which is very cool to watch. Most of the time when it happens, if the house is well involved, fire just explodes out of every window and door in the place. But because it blows fire all over, a water drop from a helicopter can cause serious injury or even death to anyone fighting fire inside. So with a couple of crews inside this house and with the helicopters flying all over doing their water drops, I became concerned that they would drop on the house with my guys inside. So I called command on the radio. Of course that was exactly what I did not want them to do. “Command from Oak Knoll Division, DO NOT drop water on the house across from 8106.” I repeated my request. Tyler, who’s already on the helicopter pilot’s frequency, radios the request directly to the pilot. The helicopter flies off, and the firefighters operating inside are saved. You see, the problem was, I rarely speak to helicopter pilots because my Fire Department is primarily a structural fire department. I’m don’t know who the pilots are. There are over one hundred frequencies programmed into my radio and the last time I used the one for helicopters was at a training six months ago. My friend Tyler works for a wildland fire agency, he talks to helicopter pilots all the time. He knows them. His radio is on their frequency, and communication is easy. But that’s not the only way Jesus prayed. Jesus prayed all kinds of different ways. He prayed when he was baptized, he prayed before making a trip, he prayed before healing people, he prayed after healing people, he prayed before important decisions, he prayed to give thanks before eating and feeding 5,000 people. Jesus prayed alone, and he prayed in public. Man, did Jesus ever pray. The list of verses where we see Jesus praying is so long, it would be awkward to include it as a reference in the body of the text. So you’ll find it at the bottom under the References and Resources heading. Your prayers and my prayers are a lot like the radio communication up to that helicopter. When we’re in constant communication with our Father in heaven, it’s so much easier to find God’s frequency, so to speak. And when we do our relationship with Him is rich, and full, and intimate. That’s the way Jesus prayed, and that’s the way Jesus’ relationship was with our Father. But when our prayers are rare, when our scripture reading is only occasional, when our church attendance is sporadic, our communication with Him suffers. It can be difficult to find His frequency. So don’t hide from God. Talk with Him in prayer. Listen to Him by reading His word. Fellowship with Him by attending a church that teaches through all of His book. Pray on your face. Pray lifting you eyes to the heavens. Pray thanksgiving. Pray for His will to be done. Pray for forgiveness. Pray for yourself. Pray for people you love. Pray for your enemies. Pray that your Father in heaven will help you to pray. Don’t give up. Become practiced at finding His frequency. * The Incident Commander at the fire on Oak Knoll was a good one. But incident commanders are often swamped with all types of communication including face to face, cell phone, and radio communication over multiple frequencies. Not receiving a response for awhile or misunderstanding a radio transmission is not at all uncommon for any fire department operating on a large scale incident. It’s kind of a weird coincidence, but my sister now lives next door to the first house in the row of 11 homes that burned on the Oak Knoll fire. This entry was posted in Bible Study, Prayer and tagged Draw close to God, how did Jesus pray, how to pray, pray without ceasing, prayer by Kurt Bennett. Bookmark the permalink. My heart was racing Kurt as I was reading your blog post. It was like something out of a scene of a movie. My dear friends in Weed were on the opposite side of the road where the fire was raging on the east side of the highway the day after we left Oregon in September. We missed this Weed fire by one day, having left Medford the day before on a tight schedule. The highway was shut down for a while. We know it was the grace of God that we missed it and that our friends were safe. He looks after His own.